Below are the tasks you should do this week for getting ready for Christmas, so you can experience less stress now and when Christmas day arrives. Christmas is almost here, and my Stress Free Holidays series is almost at an end. Just like the last several weeks, everything we are doing this week relates to Christmas preparation, since it is coming soon. I know my kids and I are both excited! By now, or soon perhaps, your kids will be out of school for winter break and will be at home all day. To keep this time of year fun treat it like you would a mini summer vacation, and get into a bit of a different routine with them so that there are activities for them to do throughout the day. Now, I'm not necessarily talking about you being their non-stop source of entertainment, but activities can be good. These activities can include baking cookies or our new favorite making Grinch Kabobs, working on last-minute homemade Christmas presents, or watching special Christmas movies. 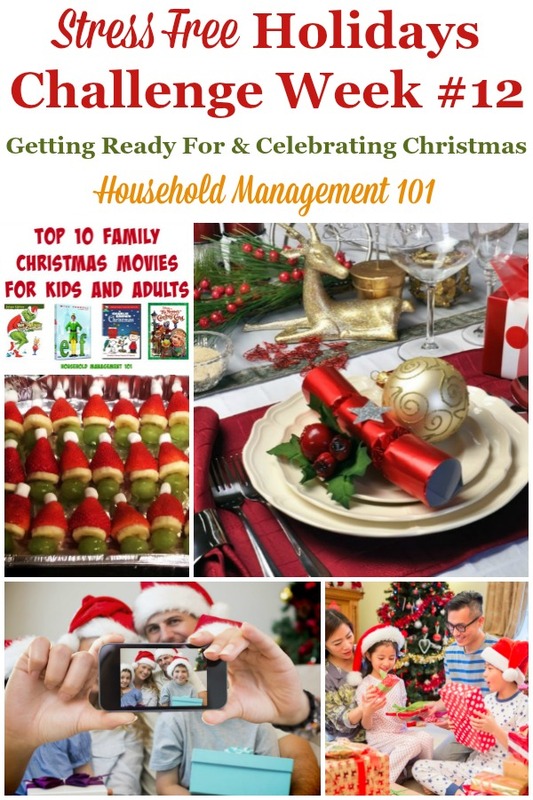 In addition, they can do activities for getting ready for Christmas too, like helping prepare the home for the holidays and any guests coming in. Remember, even after Christmas they will be home for a bit, generally until after the New Year, so plan some things for them to do after Christmas too, besides playing with any new toys and gifts they receive. As a continuation of one of the tasks from last week, this week continue to get your home cleaned and ready for guests or Christmas parties you may be hosting. Get as much non-food related preparations for the meals and guests done as possible early in the week. That may include getting beds and guest bathrooms ready, or polishing silverware, ironing and folding napkins, etc. If you're short on time for cleaning up a messy house make sure to check out my housekeeping checklist, which lists the tasks you should focus on for hosting guests. Be sure to check it out to make sure you're prioritizing properly now that time is getting short for the big day. Similar to my advice for getting ready for Thanksgiving, do as much as you can earlier in the week to get ready for guests and the big meals you'll be serving for Christmas ahead of time. 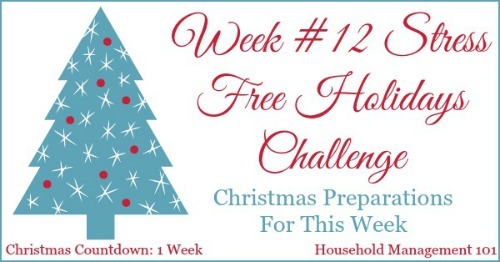 Go ahead and review the Christmas menu planner and Christmas grocery list forms I asked you to fill out a few weeks ago as part of the challenge and see what you can do early in the week, versus what must be done the day of the meal. Some people eat turkey at Christmastime too, so remember when getting ready for Christmas to defrost your bird in plenty of time. 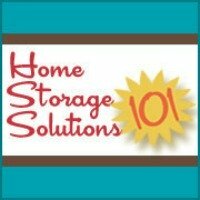 Here is the article on how to defrost turkey, which gives safety guidelines for when to begin defrosting, and with what method, if you need it. Last week, as part of our Christmas preparations, I asked you to create your own Christmas to do list with anything left you needed to do, that was unique to you and your family. This week you just need to continue working on these items, as you have time and energy. Remember, if you've bitten off more than you can chew you can always just decide not to do a couple activities this year. There is never any need to self-impose stress into your life, especially when getting ready for Christmas takes so much time and effort anyway. Christmas is almost here, so go ahead and go to Christmas parties, drive around and see the lights on houses with your kids, and generally just enjoy the holiday season. There is no point in getting ready for Christmas if you aren't going to sit back and enjoy it now that it is here! I hope each of you has a Merry Christmas this year. In addition, I hope with this series that the whole holiday season has been a little bit more fun and joyful, and less stressful for you this year! I'd love to hear how your preparations are going this week in the comments below. 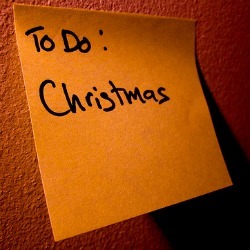 Do you still have presents left to wrap, homemade food items to make, or whatever else is on your personal to do list? Also, tell me how you're enjoying your stress free Christmas season now that you've put in this extra preparation. If you missed the previous parts of this series, you can still jump in. 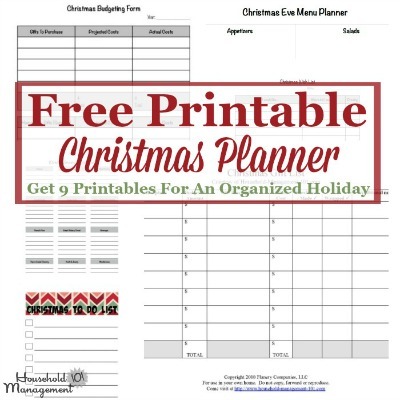 There is always time to start getting ready for Christmas to make your holidays stress free.